This classy bed was designed with simple sophistication for your four-pawed friends. The frame was designed with swirls on three sides, which brings out the unique styling of the bed. 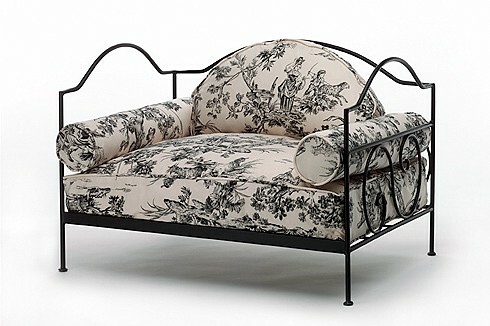 We feature a "Ebony Toile" fabric and the black powder coat paint compliments the pattern. Please specify fabric and frame color choice upon checkout. Enhance your home d�cor with our wide selection of upholstery fabrics. 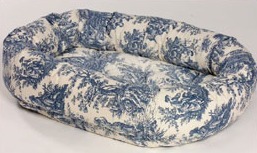 Unique two-piece design  dogs love the security of the outer ring, while the removable bottom cushion can be used as a travel mat or crate mat. MACHINE WASHABLE / DRYABLE: Unzip outer cover to wash; (remove inner bolster - do not wash). Wash bottom cushion as is; "tufting" prevents fibre from shifting or clumping. FABRIC: Wide variety of 100% cotton prints, solids, Sueded and Micro-Velvet. INNER FILLER: "High-Memory" polyester fibre. 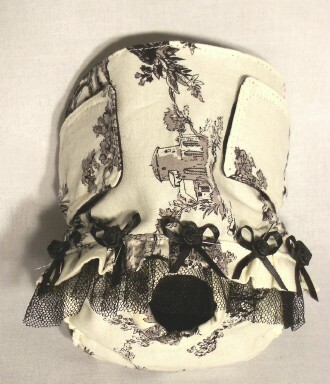 Available in Black, Blue, Green, or Red Toile. Please specify color upon checkout. The beauty of Toile combined with luxurious microvelvets make this throw blanket a decorative and practical addition to any room; (reversible). Protect your furniture in style or use a blanket with solid or toile donuts. MACHINE WASHABLE / DRYABLE: Diamond quilting prevents fibre-fill from shifting or clumping. FABRIC: Two-tone (back and front) sueded microvelvet with attractive contrast binding. INNER FILLER: 2" of "High-Memory" polyester fibre quilting. 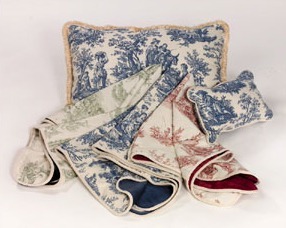 SIZES: Pillow-S(10"x16"), L(26"x36"), XL(34"x46"). Throw Blanket-42"x53". 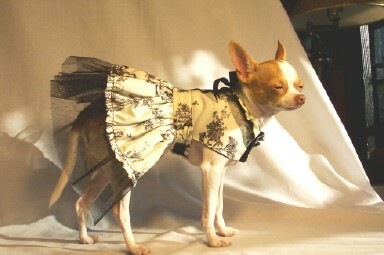 Ivory Toile with black tulle undersash. Ivory Toile with black ribbon roses along the ruffle. Sizes 6-18. 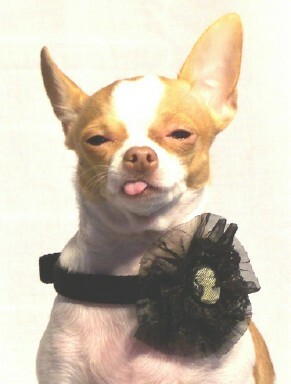 The Cameo collar and leash are made of black velvet with a Cameo ruffle of organza and tuile. Sizes 6-18. Please specify sizes upon checkout.